This product requires the base game XCOM: Enemy Unknown. © 1994-2012 Take-Two Interactive Software, Inc. Take-Two Interactive Software, Inc., 2K, 2K Games, Firaxis Games, XCOM, and XCOM: Enemy Unknown, and their respective logos are trademarks of Take-Two Interactive Software, Inc. The ratings icon is a trademark of the Entertainment Software Association. Unreal® is a registered trademark of Epic Games, Inc. Unreal® Engine, Copyright 1998-2012, Epic Games, Inc. Uses Bink Video Technology. Copyright © 1997-2012 by RAD Game Tools, Inc. This software product includes Autodesk® Scaleform® software, © 2012 Autodesk, Inc. Autodesk, and Scaleform are registered trademarks or trademarks of Autodesk, Inc., and/or its subsidiaries and/or affiliates in the USA and/or other countries. © 2012 NVIDIA Corporation. All rights reserved. NVIDIA, the NVIDIA logo, PhysX, The way it’s meant to be played, and 3D Vision are trademarks or registered trademarks of NVIDIA Corporation in the U.S. and other countries. All rights reserved. All other marks are property of their respective owners. 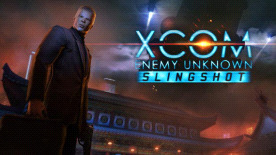 XCOM: Enemy Unknown is required to play this DLC.